Greetings, dear readers! I can't believe it is almost the middle of October and I am only now getting to create and share a nail art look for Halloween! I actually had a very different nail art design started earlier today, but I'm afraid to say it was a total bust. Everything ended up being a jumbled mess and the beautiful idea I had in my head just didn't quite work out as planned. I may try it again using different techniques, but for now, I hope you enjoy my simple stamped Halloween design! I picked up a few shades from the Philly Loves Lacquer West Philly Collection, and while I didn't realize it when I picked them up, I noticed when they were sitting next to each other on my desk just how perfectly the colours worked together for Halloween. To create this look, I used Philly Loves Lacquer shades in Carrot Cake Man, Powelton Pearl, and Activist Amethyst. I used images from Bundle Monster stamping plates BM-224 and BM-H07. I used stamping polishes by Girly Bits Cosmetics (Flame), Celestial Cosmetics for Color4Nails (Amethyst and Pearl), and Powder Perfect (Black). Because I had to take off one nail art look today and start from scratch for today's post, I didn't get these shades swatched and photographed on my swatch hand. That being said, I did quick snap a photo of each colour so you can check them out since they are gorgeous! Ah, my orange loving heart is content with this shade! I picked this up on a whim since I generally avoid white polishes, but I really love this one! I needed four coats for opacity, but it was so worth it! Yet another gorgeous shade from the West Philly Collection! You can pick up polishes from the West Philly Collection at Philly Loves Lacquer here. I believe Activist Amethyst is sold out, but the other two shades and several others are still available! 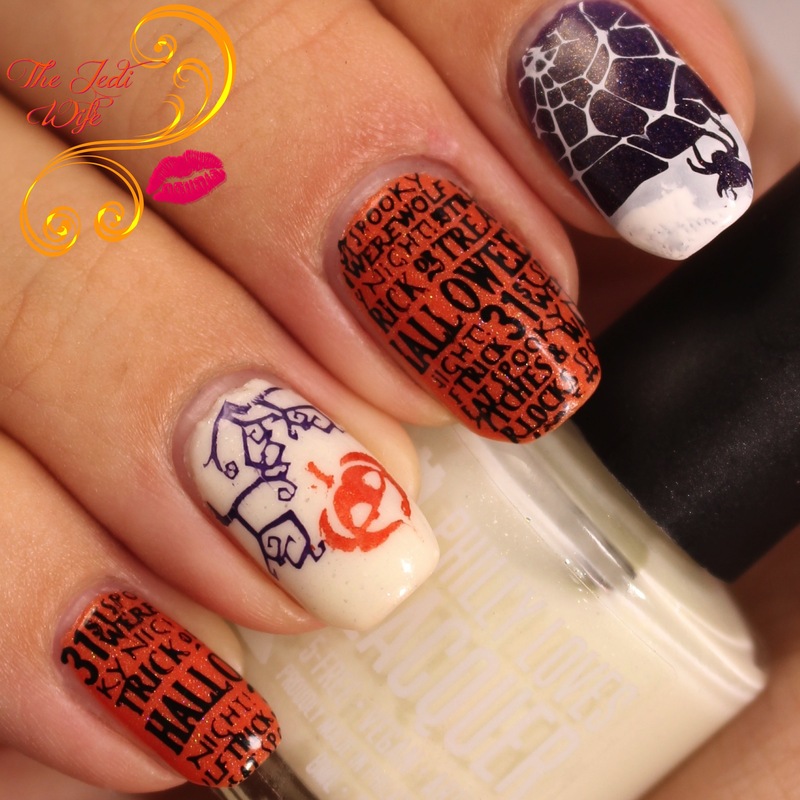 Have you been planning your Halloween manicures? What have you done so far? What are you thinking of doing? I'd love to hear from you! Halloween manicures are my favorite. I haven't done enough yet! This trio is perfect. Activist Amethyst. I need that. Those really did work perfectly for a Halloween mani! These three are beautiful! I love how you utilized them. So sad she is closing up shop. Love your mani! I cannot believe she's closing, my heart is totally broken. I love love love your web nail! This mani is great! I'm trying to get caught up on this nail art challenge that I'm participating in!